Many comedians are courageous, but it takes a special type of spirit to begin your stand-up career while in prison. 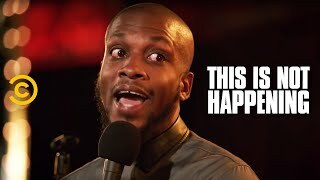 Ali Siddiq has just that type spirit. He stood in front of a judgmental crowd and petitioned for their time and attention and has been captivating audiences ever since. Headlining multiple US Comedy Clubs and others around the world Ali has shown his ability to engage diverse audiences leaving many on their feet talking everything from fatherhood, politics, grocery shopping and education to Nigerian stripper associations. The most recent winner of Comedy Central’s Up Next Competition Houston’s Ali has appeared on Showtime’s Ladies Night Out Tour, Centric’s 2014 All Star Taping, BET’s Comic View and HBO’s Def Comedy Jam. With 3 released albums, 2 just last year, Ali is preparing a 4th for 2014.